SembPres, short form for Sembawang Presbyterian Church in the logo, portrays a congregation worshipping our Lord Jesus Christ, represented by His Cross. Our theme verse taken from Zechariah 4:6, “Not by might nor by power, but by My Spirit,” says the Lord Almighty. – is explained in the logo. 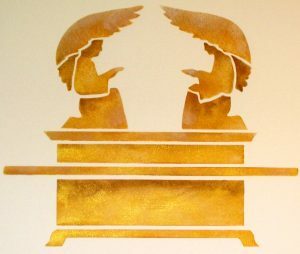 The letters S and E that enfold the name ‘SembPres’ abbreviate ‘Esprit’, which is French for ‘Spirit’, and are made to represent the two “cherubim” on the cover of the Ark of the Covenant (Exodus 25:22), with their faces turned toward one another and with outspread wings. The letters S are taken from the F-holes of a violin. The shape expresses all creation kneeling to worship and praise the Lord with music. The letters M and Pr abbreviate ‘might’ and ‘power’ respectively, and are made smaller in size than the letters S to emphasize that the Holy Spirit is greater than human strength and wisdom. The prominent letter ‘b’ in the centre which is different from the other letters, abbreviates the word ‘but’ (meaning but we depend on God) and also represents the body of Christ. The Cross in red (colour not shown here) reminds us of Jesus’ blood shed for us for the remission of our sins and we are to always turn our eyes upon Him.